Today’s a very special day for dog lovers to rejoice in the pure, unconditional love that their furry friends offer them – it’s National Puppy Day! Celebrated annually on March 23rd, National Puppy Day was originally founded to raise awareness for orphaned puppies around the world as well as to deter others from adopting from puppy mills. One of the ways we can celebrate today is by sharing pictures of puppies (which, I firmly believe, also extends to adult dogs, who will always be puppies). 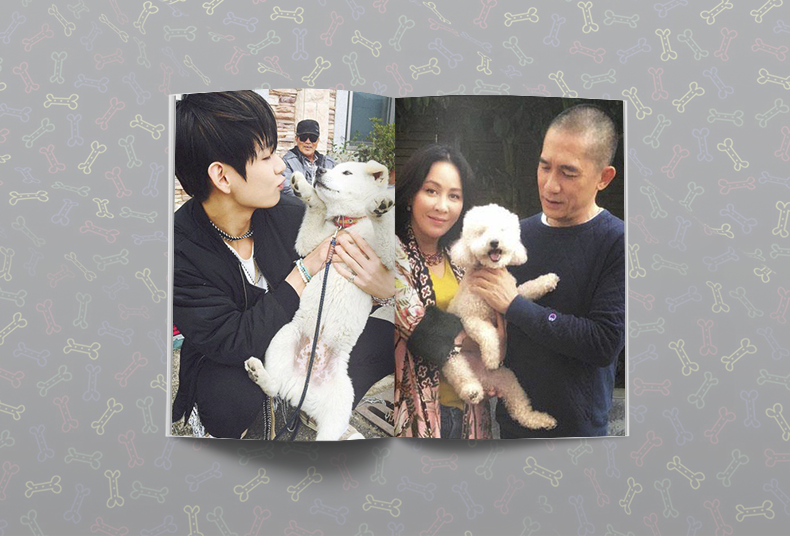 So, here are some East Asian celebrities who own doggos. In EXO Showtime, EXO‘s main dancer Kai introduced his family of puppies to viewers – Janggu (left), Jjangah (middle), and Monggu (right). That brings up the grand total to three dogs! Monggu even charmed Kai’s sunbaes behind the scenes in the making of a W photo shoot. Like owner, like puppy. But really, we can never have enough fluffy friends, so I’m sure we can anticipate a whole army of poodles from him soon. Whew. In the spirit of National Puppy Day, you absolutely have to watch Kai play with another puppy in the making of Miracles in December (at around the 4:06 mark). It’s not his own puppy, but it’s so fluffy that I had to punch a wall afterwards just to feel manly again. BTS’s V is yet another Korean idol with more than one pooch, Yeontan (left), Soonshim (middle), and SsyongSsyong (right). V first introduced one of them, Soonshim, in one of his “V’s Log” series back in 2015. Funnily enough, both owner and puppy have very similar excitable, hyperactive, and playful personalities. Not to mention the fact that they’re both also very beautiful. We found out about Ssyongssyong on Twitter while Yeontan is the most recent addition to his family. According to @vlissful, the name Yeontan might be a reference to the dark colour of Korean coal briquettes (“yeontan” in Korean) as well as his own group name, Bangtan Sonyeondan. Next on the list is, not one, but two dog owners. Legendary Hong Kong power couple thespians Tony Leung Chiu Wai and Carina Lau kicked off the Lunar New Year by sharing pictures of themselves with their beloved puppy. I mean, it’s pretty apt, considering it’s the Year of The Dog in the Chinese lunar calendar. The couple has been happy together for nearly three decades now, making this family portrait all the more heartwarming. Love is still very much alive and kicking! Tony Leung also revealed that he would be less active this year to spend more time with his family. That means more puppy time. Taiwanese actor Nicky Wu and Chinese actress Liu Shi Shi (also known as Cecilia Liu) are yet another set of proud puppy parents. Liu Shi Shi and Nicky Wu adopted Xiao Long Bao (the one with darker fur, on the right) sometime after tying the knot back in 2015. I’m guessing that they must really love Chinese steamed buns. Not long after, Nicky Wu shared an adorable family portrait taken while celebrating his 45th birthday, featuring yet another puppy next to Xiao Long Bao. Hopefully, we’d get another post about their dogs for National Puppy Day because why not, right? Or perhaps… yet another new puppy? Let’s now move on to Japan, where Japanese idol Tomohisa Yamashita — also fondly known as Yamapi — and his entire family are all dog lovers. In fact, when asked whether he was a cat or dog person, Yamapi proclaimed himself as a dog person. The Yamashita family currently has two dogs — a miniature dachshund and poodle, by the names of Hime (right, lighter fur) and Po-chan (left). Unfortunately, one of his older miniature dachshunds Pi-chan (right, darker brown fur) recently passed away. But 17 years of her memory will undoubtedly remain a precious one for the family. Cherish your puppies, everyone. Every moment will be magical if you do. Mega-popular Japanese singer Namie Amuro owns three dogs, too, as seen above. They’re named Gatchan (left), Ararechan (middle), and last but definitely not least, Koto (right). These pictures of the three sisters are from 2011, so really, this is also a belated #throwbackthursday. 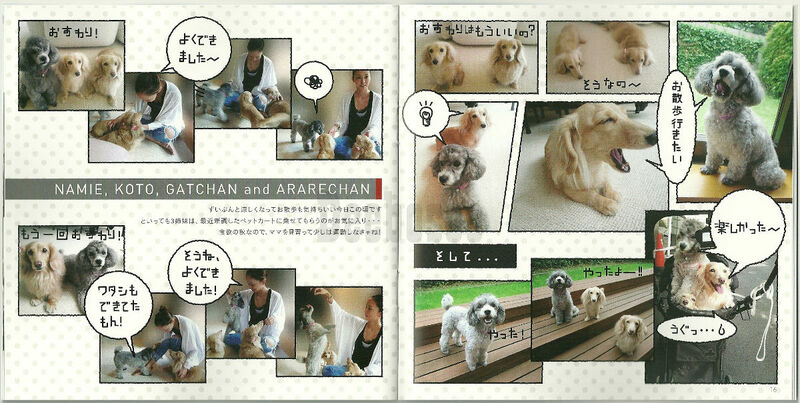 According to Namie in a past fan magazine, they enjoyed going for walks in their pet cart, something like a pram for dogs. Another little trivia: Koto, Gatchan, and Ararechan were featured in a game alongside the release of Sit! Stay! Wait! Down! and Love Story. The perks of having a Japanese pop music legend as an owner! Although I’m personally more of a cat person, I grew up watching Clifford the Big Red Dog so I can’t help but coo from afar whenever I see a puppy. I especially adore bigger dogs (probably directly because of Clifford, again), and V’s Soonshim is the absolute cutest in my eyes. I wish I could cuddle with any of these dogs — but I’m pretty sure they’d be able to sniff my cat all over me. Anyway, it’s National Puppy Day so feel free to spam puppies to your heart’s content here on OneHallyu. If you can afford to adopt a puppy, I say go ahead and do it! But remember that you must care for your pets responsibly. Do check out the nearest animal shelter in your area. Just imagine all the beautiful puppies waiting for someone to fall in love with them and bring them home.